General Hospital (GH) spoilers tease that Sam (Kelly Monaco) will grow increasingly concerned about her husband. Jason (Billy Miller) has been having a rough time since Patient Six (Steve Burton) hit town. He’s in a constant state of agitation and Sam can’t figure out how to calm his fears. Of course, Sam is concerned for herself as well. She knows she’ll have to make a crucial choice eventually. 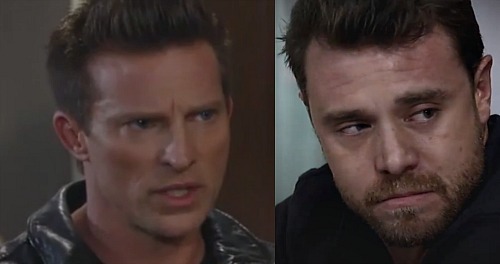 Sam is committed to Miller’s Jason, but what happens if Patient Six is proven to be the real Jason Morgan? The thought of that revelation terrifies Sam, but the truth still has to come out. Sam understands that none of them can stay in Jason limbo forever. It’s taking a toll on all parties involved. Not knowing is almost as bad as being proven wrong. General Hospital spoilers state that Jason Morgan will be identified next week. It looks like Miller’s Jason could face a tough blow. What will BM Jason do if (when) he learns he’s actually Drew? He’ll undoubtedly experience shock and denial. Current Jason believes he’s the real deal with all his heart. If his identity is stripped away, he’ll feel completely lost. Miller’s character will certainly worry about losing Sam (Kelly Monaco), Danny (T.K. Weaver) and his media company. Anger could set in as he tries to cope with all of this. However, deep despair should take over sooner or later. Miller’s character may decide he needs to be alone with his thoughts. He’ll definitely be a mess if he learns he’s been wrong all along. General Hospital spoilers say Sam will seek help from a surprising source. She’s tried to keep her distance from Patient Six lately, but new developments will force a change of plans. Sam will go to classic Jason and ask for his assistance. Miller’s GH character may be too distraught to do anything right after the reveal. He should get his fire back at some point, but Burton’s Jason may be of more use to Sam early on. Will Sam push Burton’s Jason to rev up the mastermind hunt? She may think finding the culprit would give her hubby some closure. Then again, Sam might give Burton’s Jason some other task. Whatever the case, the request could bring Sam and classic Jason closer. That trend should continue in the coming weeks. We’ll give you updates as other GH news comes in. Stick with the ABC soap and don’t forget to check CDL often for the latest General Hospital spoilers, updates and news.